Once you’ve finally chosen to remove your pool, the fun of deciding what to do with the space next can finally begin. Will it be a garden? A patio? Maybe just some lush, green lawn to enjoy whatever your heart desires in the future. If you’ve chosen to simply grow some new grass to cover the spot after your pool removal is complete, it’s important to take good care of the space to promote a beautiful lawn. Here’s what you should know about caring for your lawn after the pool demolition contractor has packed up and moved out. Choosing to remove your pool is a big decision that comes with significant benefits. After the initial expense of paying for the pool removal, your home maintenance costs will decrease. Not only will you be saving money on the chemicals, equipment, repairs, and cleaning necessary for the pool, your homeowners insurance costs will also decline due to the elimination of the drowning risk pools present. Your backyard will also be a safer place for children and pets to enjoy. In addition to saving you money and stress, removing your pool will also save you time. Instead of working to balance chemical levels in the pool or constantly skimming it to remove leaves and other contaminants, you will be able to spend time doing things you truly enjoy instead. It’s important to choose the right plants for the area that remains after your pool removal. Meadow grass and wildflowers do well in the sandy, low-nutrient soil that many pools use for their foundations. Water the ground thoroughly and remove all weeds, keeping an eye on the area for two weeks and removing weeds as necessary. Then, begin planting meadow grass and wildflower seeds that are native to your area to ensure that they will be compatible with the weather and climate. The goal of this type of lawn is an undone, natural look, so it’s best to mow the grass only after the wildflowers have shed their seeds in the fall. For a more traditional lawn, add organic matter to the soil before planting grass or shrubbery. This helps regenerate the soil and enrich it with the nutrients necessary to support these types of plants. 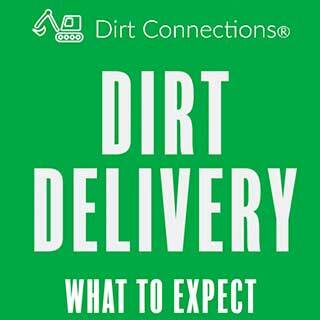 Mix a 4-inch layer of compost or manure into the soil before planting. Because swimming pools tend to be in sunny areas, consider growing grasses and plants that will thrive in those conditions. Grass that grows on sites formerly occupied by pools need more nutrients than grass growing in other areas. This is because the land has not been exposed to sun, water, and other elements necessary to create nutrient-rich soil. Proper mowing techniques can help you maintain your lawn’s health by allowing it to access as many nutrients as possible. Mowing at different blade heights can help keep the grass from being too short or too tall to soak up enough nutrients and sunlight to continue growing strong. The recommended heights vary depending on the time of year and your climate, but generally speaking, a higher blade is best for hotter parts of the year. Be sure to only remove the top third of grass blades, as cutting more than that can expose the stems to harsh sunlight and cause them to burn. It’s also important to mow with a sharp blade, which cuts grass evenly and keeps it looking beautiful. A dull blade will shred the grass instead of producing clean cuts, leaving it more susceptible to disease and in need of extra nutrients. 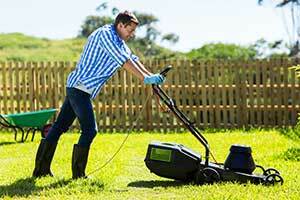 After mowing, consider leaving the clippings on the lawn to decompose. This practice helps slow water evaporation and prevent weeds from germinating. 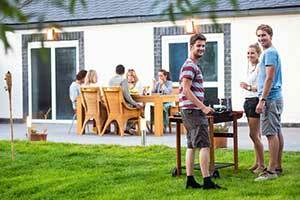 A green lawn can be difficult to maintain. Now that the area will be available for children, pets, and everyone else to walk across or play on, it’s likely that the soil beneath the grass will become even more compact than it already is after it is placed over the pool cavity. This causes problems with air circulation and water drainage, which in turn can make your grass look dull. Providing your lawn with more air and water is the first step in ensuring it achieves a beautiful color. To encourage verdant blades, aerate your lawn by poking three-inch deep holes throughout the area once per year. This loosens the soil and allows more air and water to enter the soil. It also provides entry points for microorganisms and earthworms, which both help break down thatch and continue to create clear pathways for air and water. Watering techniques can also impact the color of your grass. Instead of turning on the sprinklers a few times per week, water your grass less often but more deeply by leaving your sprinklers on for longer or using a hose. Weekly waterings that cover your lawn with about an inch of water help the roots grow deeper, keeping the color strong during times of drought or hot weather. It’s best to water your lawn in the early morning, when the potential of the water evaporating is lowest. Speak to a professional pool demolition contractor for more information and to schedule your pool removal. 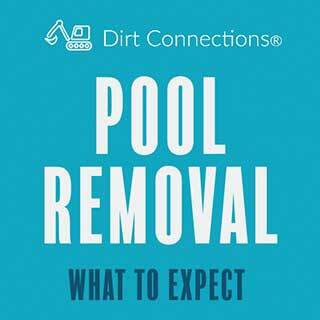 Dirt Connections offers both partial and full removals and can help you determine which type is best for your pool, budget, and planned use of land after the removal is complete. The firm also provides free estimates for all projects and works to complete them in a timely and minimally-disruptive manner, removing all debris and leaving your yard looking beautiful. 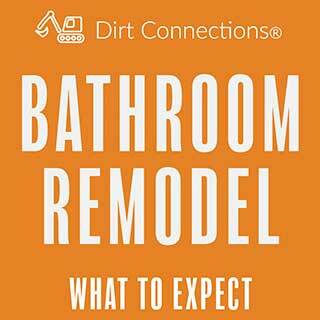 Dirt Connections also offers a variety of other home and construction services, including residential bathroom remodeling, commercial construction, pipeline work, and free fill dirt.